The US Mint went through a series of state parks and landmarks and then due to demand added a series of the 11 US minor outlying islands. 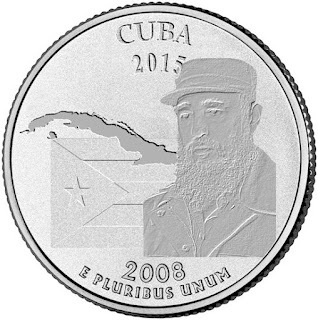 In order to satiate the desires of numismatists around the country the US Mint will be issuing what was originally a joke design, created for fun by the US Mint artists in 2008 after somebody suggested that Cuba would become the 51st state after Fidel Castro's predicted death in 2015. We came across this previously unreleased design by email from an anonymous source within the US Mint with a note suggesting that the actual design will vary slightly and the dates will be modified accordingly. Our source was unable to confirm the actual release date of this quarter or what other quarters would be included in the series. What series would you like to see on the back of your quarters? I would like to see Playmate of the Month on our quarters. Now those would be collectable. Its hard to decide what I think about them trying as hard as they can to get people to collect money to take it out of circulation so the rest of the money in circulation would be worth more.... They could come up with better ideas than thinking about our 'enemies' being incorporated into the US.